This entry was posted on Tuesday, August 24th, 2010 at 1:15 pm and is filed under Ethics & Morality, Politics. You can leave a response, or trackback from your own site. The way I understood it, the judge overruled Obama not on the basis of improper use of the Executive order, but instead because of some previous ruling which disallows research that destroys embryos. I also understand that this does little to stop the research in general, but rather the government funding of the research, am I correct? I could care less if the government funds this type of research, so long as the research is allowed to continue. Of course, I have no problem with the government funding, and would love it if the government would spend more money on science research and MUCH LESS on military research, but unfortunately my opinions matter little. It’s really the same thing. The judge ruled that the funding violated the law which once again upholds the principle that EO’s can’t overrule the law. As for the research itself – it’s really of limited benefit and has some nasty moral implications; HESC is mostly a dead-end from what I have seen with the possible exception of research into the life cycles of pathologies. It’s not going to be a means of curing anything. And “military research” is science and/or technology research, zhann. A great majority of the scientific advances that we enjoy daily came out of the civilian application of advances developed for military use. Yeah, I’m glad this came down. One of the things that used to infuriate me (and still does when I hear someone spouting off the nonsense) is someone ranting that the government is denying legitimate research by banning stem cell research. I tended to get an angry tone to my voice when confronting the idiot, asking him/her to show me exactly what law or statute prevents such research. Then when they start pointing to the fact that Bush cut off funds for such research, I then ask them to explain the difference between banning and funding. And so on. And those people were college students, some of them honor students, the best and brightest of their generation, so to speak. Lord help us all if they are that incapable of common sense and logical thought. But their thoughts are logical; they’re just based upon reams and reams of false postulates. The logic is mostly sound; it’s the premise that is very,very wrong. well, now i have to disagree entirely. the benefits of stem cell research are mind boggling. i am not sure why you say it wont cure anything, maybe you are referring to medicine of some kind, but its ability to fix the human body grow almost daily. as for military, you are going from curing to killing. military technology is simply in place to kill more people faster, the exact opposite of what stem cells are for. if i could, i would definitely switch budgets, but obviously some people may be a bit offended. Overall stem cell research is very promising, but embryonic stem cell research has, so far, proven to be useful only for studying the life cycle of certain diseases and conditions and for studying cell proliferation itself. That’s of limited benefit and lacking in direct application. On the other hand, adult-derived stem cells can be used for that same research and are also showing great promise for actual medical treatments. You are being grossly unfair. Basic stem cell research has shown substantially more gains for two simple reasons, supply is far greater in basic stem cells, and research has been going on for substantially longer. Embryonic research is constantly in flux, hence progress is in constant flux. 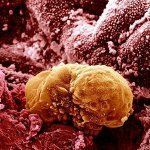 It is hard to deny the fact that embryonic stem cells have more potential over basic stem cells. Likewise, it seems wasteful to simply discard all the embryonic stem cells because of some bizarre religious beliefs. The research you cited primarily stemmed from NASA. If you consider NASA to be military, then I am in full agreement … but, since we are speaking budget, and NASA’s budget is in the low billions (not sure how much this year) while the military budget is made up of more than half of our gross national budget, i would be hard pressed to accept that relation. I don’t believe that I’m being the least bit unfair, zhann, because you’re assertion that embryonic stem cells have more potential over basic stem cells has nothing to back it up scientifically, at least not yet. Adult-derived stem cells, on the other hand are already in the early stages of actual application. All of the above trace the roots of their invention to WW2 and our Military’s science research or trace the engineering breakthroughs to apply an earlier discovery in a practical way to the same. NASA wasn’t even thought of yet, and couldn’t be thought of without the advances developed for military purposes. Bad crash! Tired! Will fill in the proper measures soon. Miss You Go onto “Kurt Horvat” facebook. For some serious stpidoity and fun..
Rest then come back. It’s been too long, but that’s my fault mostly.